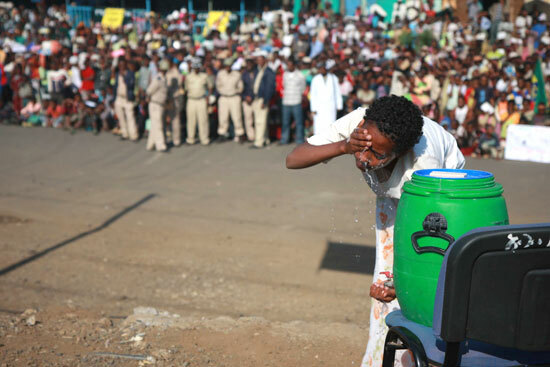 With a population of approximately 17 million, the Amhara Region of Ethiopia is one of the most severely affected trachoma-endemic areas in the world. There are currently more than 15 million people at risk of infection and approximately 470,000 people visually impaired as a result of trichiasis, the blinding form of the disease. In addition, the region is susceptible to seasonal malaria epidemics, putting the majority of the population at risk for the potentially fatal disease. Since these two diseases strike in the same geographic areas, the Amhara Region has developed an innovative strategy to deliver an integrated package of prevention and treatment interventions. The "MALTRA" program (malaria and trachoma) shows how simple public health strategies can empower communities to protect themselves and their families from these devastating diseases. A woman demonstrates face washing, a critical component of the SAFE strategy for trachoma control. With support from the Lions Clubs International Foundation and the Ethiopian Lions Club, The Carter Center implements the full SAFE strategy (Surgery, Antibiotics, Facial cleanliness, and Environmental improvement). 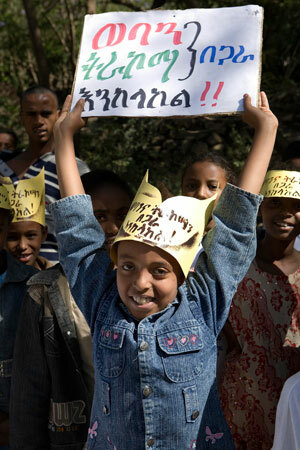 The Carter Center has assisted the Amhara Regional Health Bureau to deliver trachoma control since 2000. At the invitation of the Federal Ministry of Health, The Carter Center integrated malaria control with other program activities in the Amhara, SNNPR, and Oromia Regions in 2006. A world leader in the implementation of community-based public health interventions, The Carter Center supports the application of the full SAFE strategy for trachoma control and facilitates the distribution of long-lasting insecticidal bed nets, health education, and malaria testing and treatment in Amhara. In an effort to maximize program efficiency, The Carter Center, the Ethiopia Ministry of Health, and the Ethiopian Lions Club partnered to deliver the MALTRA program through biannual week-long outreach campaigns, known as "MALTRA weeks" that rotate approximately every six months between the eastern and western halves of Amhara to blanket the entire region. By intensifying prevention efforts into MALTRA weeks, The Carter Center is able to devote even more time throughout the year to other critical disease prevention activities that simply and inexpensively make a big impact on health in trachoma-endemic areas, such as building latrines that improve sanitation and encouraging hand and face washing. The inaugural MALTRA week covered western Amhara in November 2008. Since then, the outreach campaigns have distributed more than 17 million doses of the antibiotic azithromycin (Zithromax®, donated by Pfizer Inc.) for trachoma control. This record achievement required the participation of thousands of volunteers and health workers from the national, regional, and community levels. The distribution workers traveled by foot in and around their home villages, conducting health education, providing antibiotics, and testing for and treating malaria-catching missing households through door-to-door visits. As the MALTRA weeks continue, the people of Amhara Region are paving the way for this new health care delivery approach to be used to combat other problems. Their success is a reminder of the great potential of some of the world's poorest and most neglected people to dramatically improve their lives if they are empowered with the tools and knowledge to help themselves. Listen: Week-Long Radio Series Highlights Center's "MALTRA" Weeks in Ethiopia. Read the feature: Fly Expert Tackles Trachoma in Africa. Learn more about the Carter Center's work in Ethiopia. During MALTRA weeks, health education activities—such as schoolchildren painting signs with trachoma prevention messages—play an important role in reducing the spread of disease within the community. Approximately every six months, rotating between the eastern and western halves of Amhara Region, The Carter Center, in partnership with the Ethiopia Ministry of Health and Lions Clubs International Foundation, mobilizes millions of people in one week to receive treatments of the antibiotic azithromycin (Zithromax®, donated by Pfizer Inc.) and participate in health education workshops on preventing trachoma and malaria. This efficient and cost-effective public health strategy is paving the way for this new health care delivery approach to be used to combat other problems.